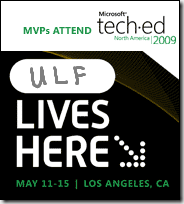 At TechEd I was staffing the Windows Server 2008 R2 Active Directory-Booth. We had a lot of interesting questions, scenarios and discussions there. One interesting issue was a customer who asked us why his contacts in Active Directory are being displayed as containers and how he can take it off. Actually this took us some time to look into it. He had two forests – when he was targeting Active Directory-Users and –Computers against one forest, his contacts were displayed as containers (meaning there was a plus-symbol right next to it and you were able to see it in the tree, with no objects underneath). On the other forest the contacts weren’t displayed as container. So we had to figure out what’s going on there. And what I’ve actually found is quite interesting, and I believe that more companies are running into this, so I found it worth documenting it on the web. In Active Directory-Users and –Computers there is an option in the view-menu which allows you to specify whether you’d like to see users, computers and groups as containers or not. In the version which ships with Windows Server 2008 (or is in the Remote Server Administration Tools of Vista and above) this setting is extended to behave on contacts as well. This setting is local to the computer and overrides any settings in the schema. So apparently Active Directory-Users and –Computers is querying the schema, sees that contacts may contain other objects and is displaying them as containers, whether you’ve set the view-option or not (in Windows Server 2003 R2 and before) because is doesn’t apply to contacts. This is fixed with the versions which are shipping in Windows Server 2008 or RSAT for Vista and higher. So if you extended the schema to Windows Server 2008 (R2), but your management consoles are still running on Windows Server 2003 (R2) / Windows XP and prior you’ll see contacts as containers. There would be a workaround – there is a setting in the display specifiers which is modifying this behavior. It’s in cn=contact-display,cn=409,cn=display specifies,cn=configuration,dc… (your forest-root domain DN, you’ll also have to exchange the 409 with your language version, where 409 equals US-English, 407 would be German a.s.o.). So the workaround is to navigate to the contact-display object, then change the Value for the “treatAsLeaf”-attribute to TRUE (by default it’s <not set>) . It’s actually not defined in the object what kind of objects can be underneath, but on the child-objects what possible superior it may have. IMHO Scripting or Programming Best-Practice would mean to query an object prior to creating a child-object for allowedChildClassesEffective to make sure that the current user has the right to create the object. The Remote Server Administration Tools for Windows 7 include the Powershell Module for Active Directory. 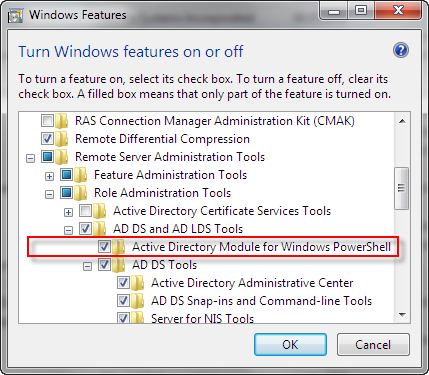 If you open the generic Powershell-Windows you’ll have to import-module ActiveDirectory first (there’s a shortcut installed in Administrative Tools which starts Powershell with this module loaded instead. Note that the PS-Provider relies on the Active Directory Webservice (ADWS), so you need one Windows Server 2008 R2 Domain Controller. ADWS is also announced to be available as Out-of-band Release/Hotfix for Windows Server 2003 and 3008, however this is currently not available. Win7 and WS2k8R2 are also just Release Candidates at this point, however I already want to mention how to do things using PSv2 since we have to get used to this in the AD-World (and it’s pretty impressive actually what you can do with it easily). Boolean Values in Active Directory are kind of weird – there are three states as opposed to two – either TRUE, FALSE or <not set> if the attribute is empty. Also the reason for a boolean value in general is to keep space limited, you only need one bit usually. However in AD the String of the Word TRUE or FALSE is stores. I do have to say that I’m super-excited – or as Mark Russinovich tries to introduce the term … “Hyper-Excited” (Mark: would this be Hyper-E? – just kidding). Bill Veghte (Sr. Vice President, Windows Business, Microsoft) and Ian McDonald (General Manager for Windows Server at MS) have introduced this morning at TechEd in Los Angeles the availability for Windows 7 and Windows Server 2008 R2 before the holiday season, meaning that Ian’s kids will be able to get the server for christmas [;)]. I do love those OSs and their new features, working with them on all my machines and not using anything else anymore (apart from customer machines where they make me too). So I’ll blog more about this, and about TechEd especially during the week. Can’t wait for Christmas now! I’ve recently heard /read some rumors about AD-Snapshots. 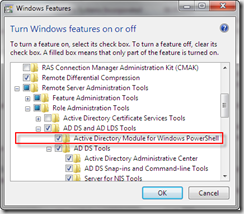 As I wrote before in Timetraveling Active Directory the new feature of Active Directory in Windows Server 2008 – AD-Snapshots or “the Database Mounting Tool” (how Microsoft calls the technology) how to look at a snapshot / backup can help you recovering data from older states of your Active Directory. I’ve also spoken about this and demoed it in my “A Directory Services Geek’s View on Active Directory Recovery in Windows Server 2008” which was so far presented at TechEd Europe 2007 in Barcelona, the German Windows Server 2008 Launch in Frankfurt, the Directory Experts Conference 2008 in Chicago, TechEd US 2008 in Orlando, and which will pre presented at ICE-Lingen (in Lingen [;)] at the end of August. I’ve also wrote articles about this in the IT-Administrator in March and April this year. a mounted Database will show you all partitions, however Microsoft only supports the domain partition, the other partitions are not supported. One rumor I’ve recently read: Using ntdsutil to perform an authoritative restore without rebooting in Directory Service Restore Mode. This is also not supported. The only supported way to perform an authoritative restore is in DSRM. However I’ve talked to some of the developers, and they said it’ll work as long as you are rebooting instantly after performing the authoritative restore (to make sure that caches and everything is cleaned), so you can do it without DSRM (stopping AD, performing the non-authoritative and the authoritative restore, then rebooting the machine without restarting AD prior). However it’s not supported!!!! If you speak German and you are unable to attend ICE you can see my session at the German Launchevent Online. If you attend ICE come there, the session has been updated [;)].